Once the hull was off the builder’s jig and right-side up it was obvious that the wales needed attention. They fit tightly to the sheer plank when viewed from the upside-down position. But when viewed from topside there were gaps of 1/16″ to 1/8″ between the wale and the plank at several places. This is easy to remedy. Wherever there was a gap, I removed the fasteners holding the wale to the hull and clamped the wale as tightly to the hull as I could. You can see the setup in the photo below. Then I refastened the wale. Wale being clamped to remove a gap between the wale and the sheer plank. There were several places where the sheer plank stood above the wale. These need to be cut back so that they are even with the top surface of the wale. I found the best way to do this was to use a chisel and follow it up with a sanding long board. Trimming the sheer plank to so that it meets the top surface of the wale. Now things get really tricky. 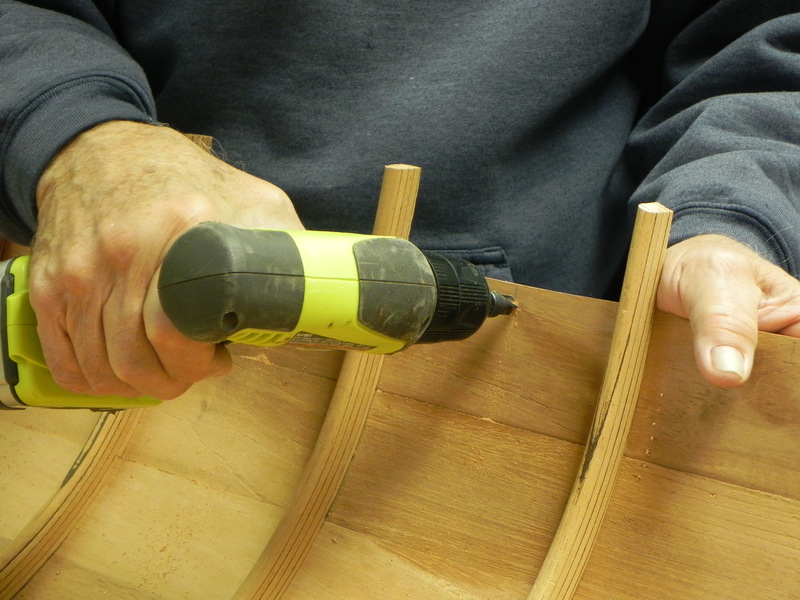 The hood (stem) ends of the wales have to be cut off and shaped to fit nicely to the stem. This is difficult for several reasons; 1) the wale is standing off from the stem so it is hard to determine where to make a cut, 2) the stem cross section is triangular in shape at this point and may be somewhat rounded as well, 3) the wales are coming into the stem slightly rotated off the perpendicular. 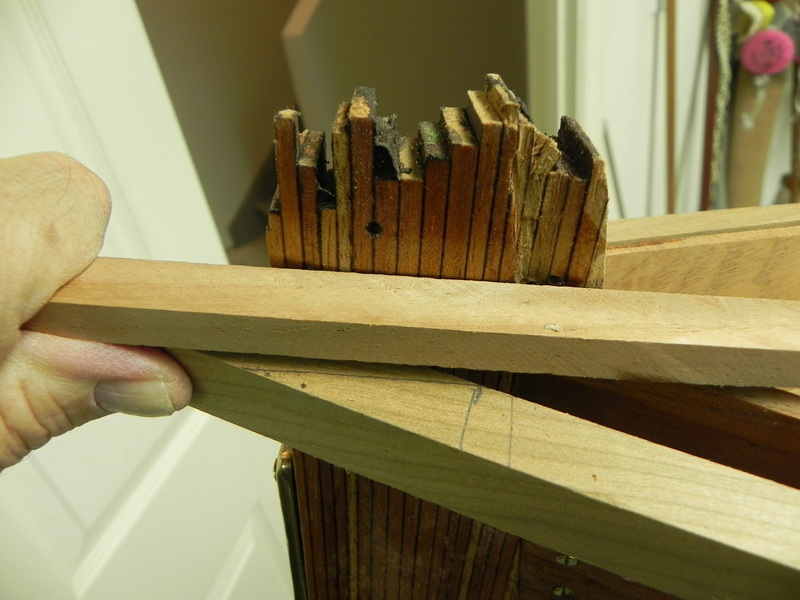 I found the best way to judge where to cut the ends of the wales was to use what I call a “toggle”. It is a piece of stock the same width as the wale and about 12″ to 18″ long. It is placed right on the sheer plank with its forward end right at the stem rabbett. 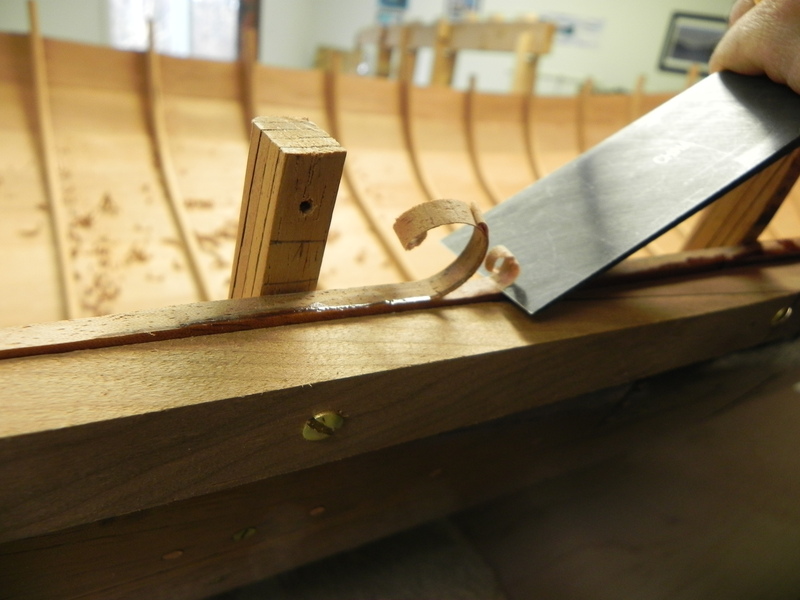 Once in position, you swing the toggle out to the wale and use its end to mark where the cut starts. Perhaps the photo below shows better what I am trying to convey. The wale toggle is up against the stem rabbett. It is swung out to the wale and a line drawn along its end to indicate where to start cutting off the wale. 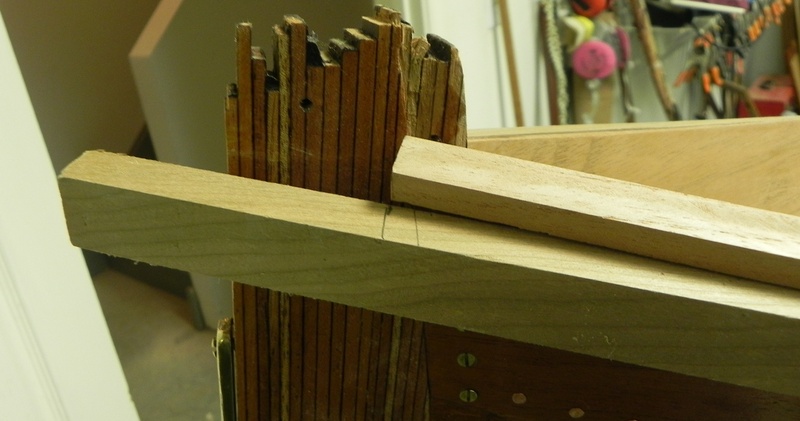 Now, how to complete laying out the wale joinery? The next step is to take a piece of stock that will delineate a line parallel to the stem. This line will start at the inside edge of the line you just marked off on the wale. Again, a photo may be worth a thousand words. Laying out the cut off of the wale end. This will get you in “the ball park” for making the cut. It will take some patience and time to get the job done. Two of my cuts came darn close but the others required some fiddling around. The last job is a minor duty. The top of the sheer plank should be fastened to the wale at each rib station. This is done by centering a #4 X 5/8″ screw at each rib station and about 1/4″ down as shown below. 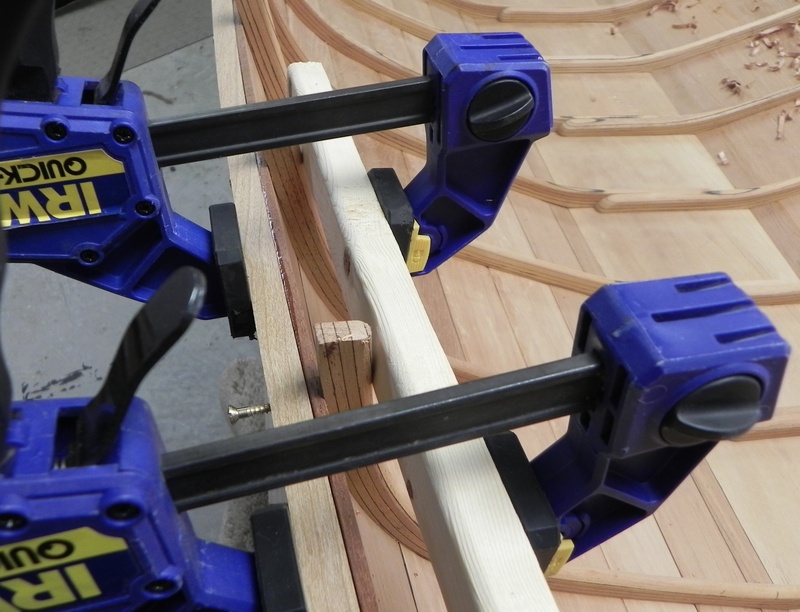 Previous post Building an Adirondack Guideboat-off the jig!